15 December 2017 James Watiti: One way to describe partnerships is to list the different agencies you have interacted with in a campaign. With more than five successful partnership campaigns so far in three countries, this should be an easy story for the ASHC team. However, the real and more intriguing story of partnership actually lies in the details. A good number of multi-partner and multi-media campaigns have been successfully undertaken in this way for priority crops such as and Sweet potato in Tanzania, Ghana and Nigeria. 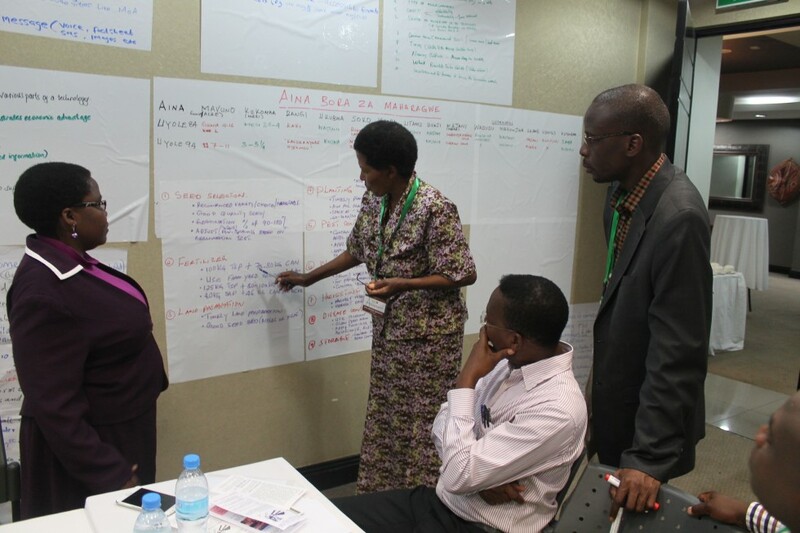 For the ASHC team working on Common bean, Soybean, Cassava, and Maize the lessons came in handy in defining the way we work and engage in developing scale-up campaigns over the last few years. One key lesson appears to point to the surprising difficulty with building consensus, on what eventually constitute the key messages to be delivered through a campaign. Because of the participatory nature of the campaign approaches, they invite debate, analysis and validation before acceptance, delay and sometimes even down-right rejection. For instance, to accommodate the needs of the scientist partner in the campaign a message should retain a high degree of objectivity and empirical rigour. This is often in contrast with the reality of what an extension agent can meaningfully recommend to farmers. In turn, with what the farmer can practically implement on his field is based on a variety of considerations such as resources available, complexity of the technology, availability of some of the required inputs and the relevance of the technology to the farmer’s household economy. How then do you balance the seemingly equally important, but obviously divergent needs of the campaign partnership? In our experience it takes the deliberate role of an honest and impartial knowledge and partnership broker to achieve this. In ASHC we engage in a consultative process of developing a ‘technology brief’. In the brief, every effort is made to involve the input, perspectives and concerns of the key stakeholders in the campaign. The result is usually a simplified, but scientifically acceptable breakdown of the key messages that need to reach the target audience. The brief then becomes the basis for adapting messages for multiple dissemination channels and formats such as radio, mobile SMS, and print material. There is need to take on a ‘conversational’ approach to message development. Lesson 2: Who has the mandate? The second key lesson we have learnt is to carefully identify with whom the ‘mandate’ lies as the main avenue for public information campaigns on agricultural technologies. This is a particularly interesting one. In our experience, we came across situations where debate arose about who holds the mandate. In some countries, this mandate may be shared or even contested between institutions. In some countries these mandates may have been earned through perceived proven track record, results, and community level impact while in others, they are bestowed by institutional affiliation to key government agencies or functions. Linking with the key mandate holders is key to anchor campaign efforts successfully. This often takes time, negotiation, resources, and quite frankly, patience! The ASHC team encountered a number of iterations of these mandates in National Agricultural Institutes, National Ministry of Agriculture, and Universities with strong agricultural research programmes and even NGOs that have built track record and gained recognition by national actors. Lesson 3: Is it the audience or audiences? The third lesson is the target audience. This appears straight forward until you encounter the complexity that is brought about by the policy context, community and gender dynamics, and eventually the Value Chain perspective! A clear and coherent message targeted only at the farmer may fall flat if the policy context and gender dynamics are not conducive for practical application. This often means that partners must anticipate the full range of communication environments that such messages will play out. It might also mean going the extra mile to design messages for the other critical parts of the farmer’s ecosystem to increase their utility. Within ASHC and associated projects, the team had to contend with supporting participation of other value chain actors that would enable the farmer audience to effectively use the information shared with them in campaign materials. This array of actors often included the private sector, community leadership, and policy leaders. There are many other lessons that can ensure a successful campaign on a priority crop or technology, but these three tend to stand out in the last few campaigns.